Last Sunday I went to an event I’d been looking forward to for ages. It was called A Day with Ronald Hutton and Friends and was a pagan conference in London organised by The Centre For Pagan Studies in association with Greenmantle Magazine. Now, Ronald Hutton (pictured right) is a very well known figure, especially in pagan circles. 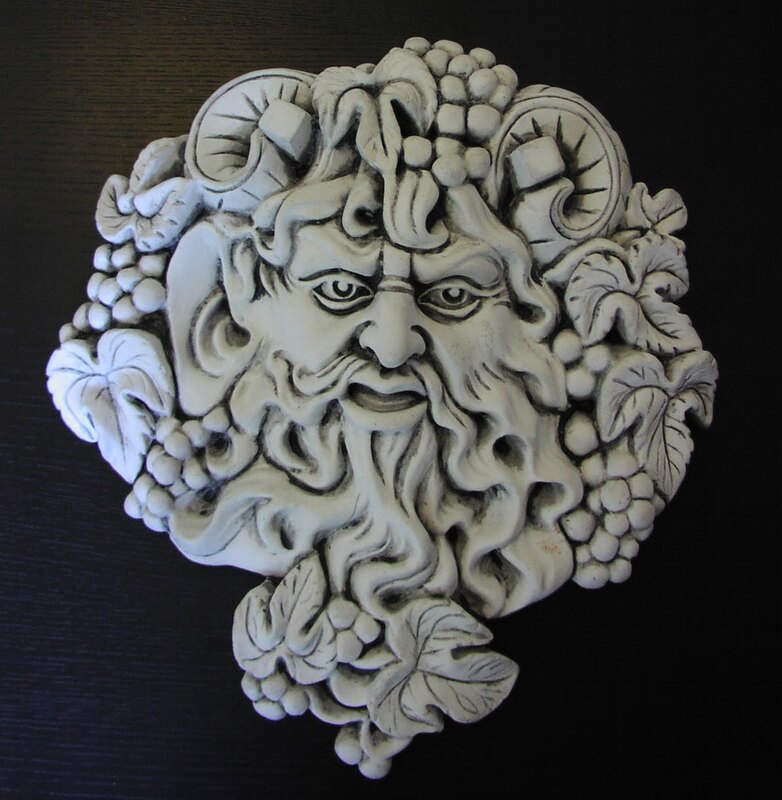 He is Professor of History at the University of Bristol and specialises in Early Modern Britain, British folklore, pre-Christian religion and contemporary paganism. He regularly appears on TV and radio, recently on Channel 5’s The King's War On Witches: Revealed. Among Wiccans, he is probably best known for his book The Triumph of the Moon: A History of Modern Pagan Witchcraft, which examined the history of Wicca in a way that cleared up many misconceptions about the modern pagan religion, but also gave it credibility. Previous CFPS conferences honoured the founders of modern Wicca, Gerald Gardner and Doreen Valiente, both of whom have passed to the Summerlands. 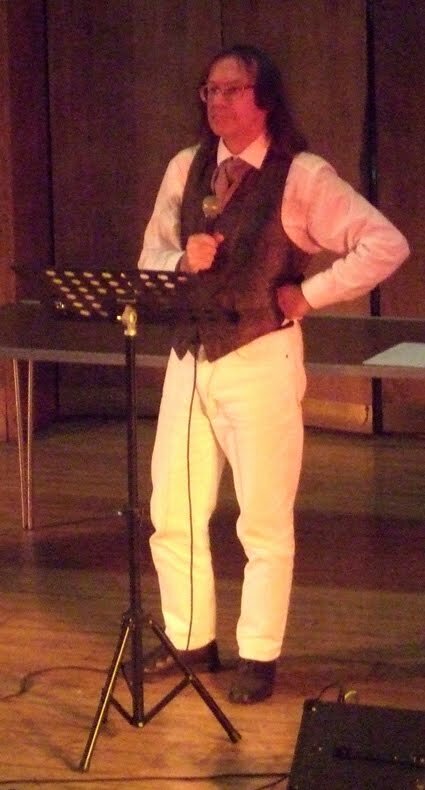 This event honoured someone still alive because, as master of ceremonies Brian Botham said: “If anyone deserves an event for giving paganism a high profile in this country it is Ronald Hutton – and why not say something good about someone while they are still around to appreciate it?” Absolutely. The day was packed with illustrious speakers, including Rufus and Melissa Harrington, Prudence Jones, Philip Hessleton, Peter Nash and Professor Ronald Hutton himself. The talks were all superb, concentrating on the history of paganism and revealing many bits of information of which I was previously unaware. 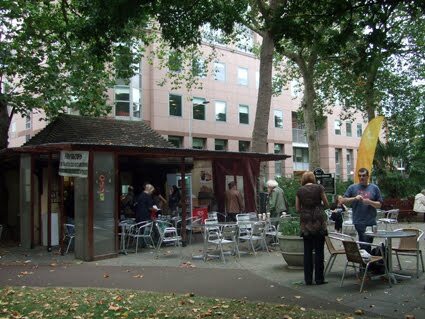 1) Morning coffee in the Cafe in the Park opposite the Conway Hall conference venue before the event even started. Breakfast in lovely company and lovely surroundings, then just strolling in as the doors opened. 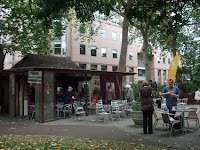 You can see the cafe pictured on the right. 2) Meeting friends. Too many to name. I think I could have hugged almost everyone there if there’d been time. 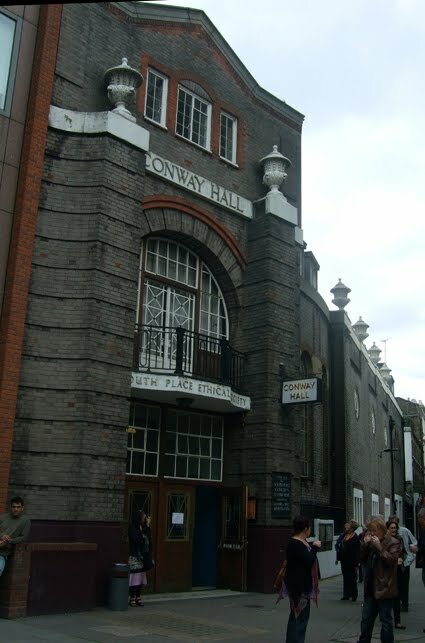 3) Conway Hall itself (pictured above left), an amazing London venue that hosts many pagan events. It has above the stage the words: “To thine own self be true” - a quote from Hamlet and also a principle of modern pagan spirituality. 4) Window shopping. I couldn’t afford to buy much, but I was tempted. One company that had a stall there was Bel Bucca, maker of idols and altar pieces of the Old Ones. 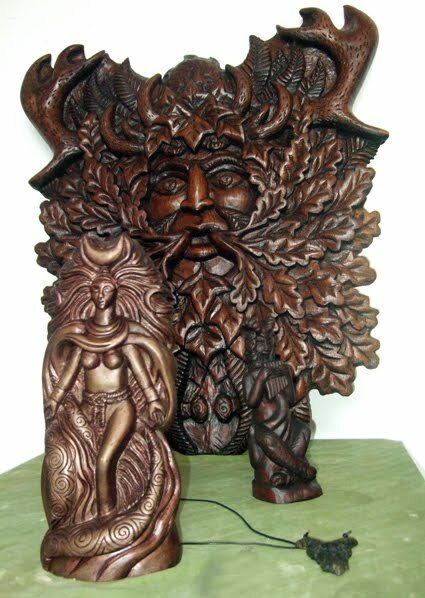 These are the craftsmen who made the goddess statue that Doreen Valiente had on her own altar and you can see a couple of examples of Bel Bucca’s work in the picture on the right. 5) Learning lots – including discovering, from Ronald Hutton’s talk, that Stonehenge was built by cowboy builders and was pretty much a disaster from the start. Those fallen down stones were like that almost as soon as the last lintel was put in place. 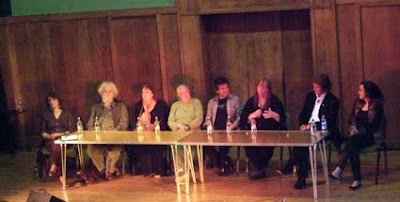 6) The Panel - a chance for the audience to put difficult questions about past, present and future of paganism to those in the know. You can see the panel in the picture at the bottom, from the left they are Prudence Jones, Philip Hessleton, Caroline Wise, Marian Green (I think), Peter Nash, Julia Phillips, Rufus Harrington and Melissa Harrington. 7) The raffle. Ronald Hutton drawing the tickets and then saying what happened in history in the year of each ticket number. 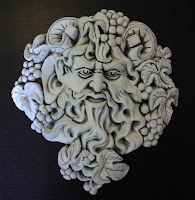 Oh, and winning a prize in the raffle too – that rather nice plaque of Bacchus you can see pictured left, which I believe was donated by TV psychic Carrie Kirkpatrick. I have been lucky in raffles over the years. 8) Getting a little drunk with several other witches in a pub down the road in the evening; catching up on gossip. I don’t even regret the fact that staying in the pub too long meant I missed The Dolmen, about which a friend later posted on Facebook “Taloch makes middle-aged married ladies like me go all peculiar”. 9) Supporting a good cause. Money raised at the event went to The Doreen Valiente Foundation, a recognised UK charity set up for the protection of the collection of Doreen Valiente's legacy. 10) Going away from the conference feeling good about the future of Wicca and of paganism in general. Knowing that there are so many amazing people out there working in the interests of the pagan religion in the UK and that we will see many great things happen in the years to come. I do apologise that the photos of people on the stage are rather poor quality. I don't use flash when I'm taking pictures of people during lectures because I think it could be distracting. Good to finally meet you Lucya, as brief as it was. We had just been introduced when I was snatched way to be presentated with an award by John Balham-Payne on stage in the main hall. George - Congratulations on winning the award! It was good to chat with you. Bel Bucca is a person, not a company of craftsmen! He carves all the pieces himself. Gemma, thanks for correcting me! I was there! Wasn't it a great day? ?